From poverty to education, the Academy has created a roadmap designed to guide the next U.S. president on issues that will impact children’s health and well-being. 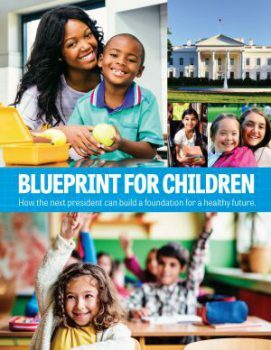 AAP leaders and other experts gathered Monday to discuss the plan Blueprint for Children: How the Next President Can Build a Foundation for a Healthy Future. The AAP blueprint, which has been endorsed by 10 additional health and medical organizations, lays out policy recommendations with four themes — promoting healthy children, supporting secure families, building strong communities and ensuring the U.S. is a leading nation for children. Monday’s panel discussion moderated by ABC News Chief Health and Medical Editor Richard Besser, M.D., FAAP, touched on each of these areas with input from AAP President Benard P. Dreyer, M.D., FAAP; Mona Hanna-Attisha, M.D., M.P.H., FAAP, director of Michigan State University and Hurley Children’s Hospital Pediatric Public Health Initiative; Alma J. Powell, chair of America’s Promise Alliance; and Jared Bernstein, Ph.D., senior fellow at the Center on Budget and Policy Priorities. One of the top priorities Dr. Dreyer would like the new U.S. president to address is early childhood development. “The early years are key and critical to the success of a child, and they are hard to make up for if you don’t do something during the early years,” he said. He called for expanding access to preschool and programs like Head Start, amplifying the recommendations in the blueprint. Dr. Bernstein agreed, saying such programs have been shown to improve employment rates and health while lowering incarceration rates and the need for public programs. The U.S.’s lack of emphasis on early education programs is “the biggest policy mistake we make in this country year after year after year,” he said. Children also benefit when their schools and local nonprofit groups and health organizations work together. That model is being implemented by America’s Promise Alliance, which Powell chairs. “We say every child should have a caring adult in their lives, a healthy start, safe places to learn and grow after school, a marketable skill … and an opportunity to give back,” Powell said. Attaining these are especially challenging for the one in five children living in poverty. Poor children often suffer physical, mental and social health impacts like chronic disease, toxic stress and trouble in school. The blueprint calls for an expansion of such programs like earned income tax credit, the Supplemental Nutrition Assistance Program, the Maternal, Infant and Early Childhood Home Visiting program and others that provide families with adequate income, safe housing, affordable child care and access to nutritious food. Dr. Bernstein shut down criticism that such programs lead to dependence. “The evidence is very strong, in no small part because a family with kids can’t function simply on the safety net alone, families will work when gainful employment appears,” he said. He suggested raising the minimum wage to help families out of poverty, a policy move that is echoed in the blueprint. Dr. Hanna-Attisha saw firsthand the impact of unemployment and poverty in Flint, Mich., where she discovered the city’s drinking water was causing spikes in children’s blood lead levels. Many families in Flint “have been suffering for decades” due to the loss of manufacturing jobs, she said. “Children have not been put first, and the water crisis was just a crisis on top of a crisis,” she said. The public health initiative she is leading aims to address a range of social determinants of health by providing nutrition, preschool programs and access to health care. In addition to poverty, cities like Flint also struggle with gun violence, which claims the lives of more than 2,600 children and teens across the country annually. Dr. Dreyer said he believed the country finally would improve gun control measures following the murder of 20 children and six staff members at Sandy Hook Elementary School in Newtown, Conn.
“I couldn’t imagine a society that would not respond to that,” he said. But nearly four years later, lawmakers continue to argue over gun control measures. In the blueprint, the Academy recommends implementing an assault weapons ban and improving background checks for gun purchases. One area that federal legislators from both sides of the aisle have managed to reach agreement on has been ensuring children’s access to health care through the Children’s Health Insurance Program (CHIP). Roughly 5.3% of children are uninsured and that number has been trending downward, which Dr. Dreyer called “a great victory for children and families.” However, he said work must continue to reduce the number of uninsured even further. Reauthorization of CHIP, reducing barriers to Medicaid services and addressing inequity between Medicaid and Medicare payments all will be important policy initiatives in the months to come. The Academy is calling on its members to advocate for those children’s initiatives and more through its #VoteKids campaign, which includes a prescription to vote, a PSA-style video featuring pediatrician leaders, a social media campaign and more. Dr. Hanna-Attisha said the job of a pediatrician is more than well-child visits and treating sick children.